The sun is setting through the window in room 346. In the background of the sunset, the purple sky seems to imitate the color of a face: the face of a stellated dodecahedron. Courtney Wilson, a junior, holds the face up to the sky, eyeing its sides. It is a normal Tuesday for Project Polyhedra, an undertaking-turned-club started by Mr. William Rose, its ardent sponsor. The idea arose in Mr. Rose’s Discrete Math class when discussing Euler’s Formula, which relates the number of vertices, edges, and faces of any polyhedron. The unit seemed to ignite a spark in Mr. Rose’s mind, and from the last few months of the 2017 school year, he became obsessed. “I just decided...that this is just the coolest branch of math because on one hand it’s really really hard and fascinating... , and on the other hand, it’s just shapes, it’s just the most simple thing... anyone could do it,” he recounted. She puts it down on a stack of faces just like it. Jenny Mei, another junior, creases it delicately, her fingers moving methodically with the experience of making tens and hundreds of these faces. Raphael (Rafi) Pedersen and Reynald Oliveria come into the room holding stacks of colored paper, having completed their mission to print the nets of numerous new polyhedra. Mr. Rose’s fantasies became solid, 3D-printed solids for that matter. 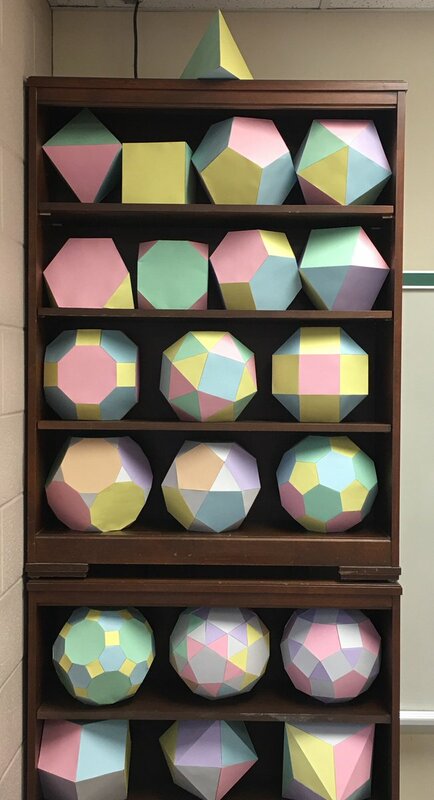 He began to buy the polyhedra preprinted, and these brightly colored, oddly-shaped objects caught the eye of students taking his math classes. Reynald shares how much they have actually helped him—“Having paper models with polyhedra makes it much easier to imagine what problems about them are really asking. Dimensional reasoning is a very practical skill… it is key to getting things unstuck.” However, these printed figures were too expensive to constantly order, so Mr. Rose began to adopt members. “There was a [factoring] camp, and Mr. Rose wanted people to make polyhedra, so I came in and made polyhedra,” detailed Courtney, holding a spirally yellow tube-shape lovingly. Jenny clutches the stellated dodecahedron in her lap, her fingers sticky with glue, while another member holds a face out to her. Reynald reviews the list of solids on the left-hand side of the board: Catalan, Archimedean, Johnson. Courtney greets new members and sets them to work in cutting, creasing, and eventually handling the pieces for gluing. Some of the projects that Project Polyhedra has done this year include making platonic solids lampshades and carving pumpkins. “They [even] made a mobile for my baby, which is incredible,” remarked Mr. Rose. These bonus projects have given the club popularity and recognition from other students, all of whom are invited to join in on the meetings. “Polyhedra are beautiful and self-evident, and you don’t need any background knowledge to appreciate them for what they are.” says Rafi earnestly. The club is also expanding its impact to the community through signing up for a FIST presentation—an event in Silver Spring dedicated to involving middle school girls in STEM. The core team stands near the doorway. Mr. Rose is hanging up the stellated dodecahedron, the dangling, star-faced figure that seems to mimic a modern ceiling-hanging. They stand around it, watching it wobble slightly, then come to a still. The moment passes: Courtney moves to her scissors; Jenny to the stack of faces; Rafi to the glue; and Reynald to the board to check off “stellated dodecahedron”. Mr. Rose returns to his desk and watches his students take ahold of his vision and move it beyond anything he had ever hoped. The day’s work is finished, but there is still an infinite world of polyhedra to uncover.